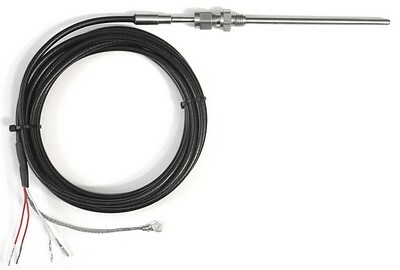 A 4-wire Pt100 class A bulb in a 3/16" (4.8mm) diameter, 160mm long 316 stainless steel sheath with plain pot seal and 3m of screened PVC lead, with stripped tails and a length of screening ring crimped for grouding. Supplied with a 1/8" BSP compression fitting. With a suitable measurement instrument a 4-wire RTD can be measured more accurately than 2 or 3-wire RTDs, especially over long distances.